Step into the wonderful land of make believe and meet with some of your favourite fairy tale characters. On the day, enjoy taking part in our fun-packed craft activities or settle in and listen to stories with Old Mother Hubbard. Suitable for all ages. All children should be accompanied by a responsible adult and no unaccompanied adults. Discover the fascinating history behind our charming mansion and its former residents in this fact-filled guided tour. You’ll be surprised by some of things you’ll find out! This workshop will provide a general introduction to the carving of soapstone. You will develop a working knowledge of the material, the tools and methods used to complete a carving. We will be exploring the mansion gardens for inspiration for your designs. 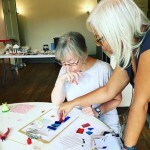 Studio artist Amanda Seljubac is back with our best-selling fused glass workshop. Make a decorative piece to take home, using specialist techniques and materials, including frit, stringers, metal inclusions and compatible glass. Get crafty as you build your own fairy house at Valentines Mansion. Join us and spend the morning unleashing your creative talents as you make a unique fairy structure for our little friends to sleep in. Learn the basics of hand weaving in this workshop inspired by the colours of nature in the mansion’s very own gardens. You will learn how to set up and warp your loom, create a fringe for your unique wall hanging and start weaving. You will be encouraged to experiment with different colours and textures provided, and let your imagination lead. Discover the art of applique in this workshop. Applique is a versatile and creative sewing technique in which fabric pieces – small or large are layered on a base fabric and then stitched in place. During this workshop you will create your own applique design in a hoop which you can take your work home in. We will be using inspiration from designs from textiles brought over by the East India Company. In the course of the 18th century the mansion had three owners that were involved in the East India Company. You will need basic sewing skills for this workshop. Design and paint your very own tea cup and saucer in this unique workshop. We will provide a range of ceramic paints as well as the crockery and tools for you to work with. During the session you will also make your own tea bags using loose leaf tea and a variety of spices. This workshop pays homage to the links the Mansion has to the East India Company who bought tea over to England from Asia. Want to learn to design and print your own designs on fabric? Sign up for this block printing workshop with artists Amanda and Sadia, and learn how to block print on fabric as you create a custom tote bag. In this 3 hour session, you will learn how to carve simple printing blocks and transfer your designs onto fabric. We will provide all the materials: linoleum blocks, carving tools, printing ink, and a plain cotton tote bag. You’ll leave with your own, custom-printed tote bag. We will be exploring Valentines Mansion gardens for inspiration for your designs. In this unique and experimental workshop we will be using natural and unusual tools to make marks on fabric. We will be exploring a series of easy and exciting ways to create imagery and pattern through experimentation. The natural tools will be found objects/ plants found in the mansion gardens. Master the principles of a contemporary textile craft in this workshop. Punch needle is a modern take on the ancient craft of rug hooking. In this 3 hour workshop, you will learn a how to use a punch needle with a variety of yarn to create your own unique piece of wall art. A range of patterns will be provided or you can choose to punch your own design. We will be exploring Valentines Mansion and gardens for inspiration for your designs. Using the traditional method of lino printing you will learn how to design and create your very own cards, gift tags and wrapping paper in this Christmas inspired workshop. Learn the art of carving and printing linocuts in one or two colours with good quality tools and inks to get excellent prints.